Prequel: Bakuman. 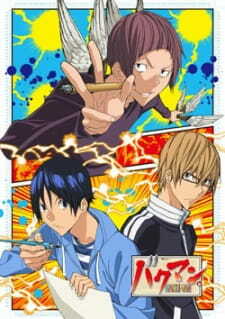 2nd Season, Bakuman. : Deraman. Bakuman 3 picks up at where the previous season ended. The quality didn't drop at all, it's as awesome as the 2nd Season and better than the 3rd. I've watched 5 episodes and given the circumstances of this anime (3rd Season) I'm sure that I can give it a worthy review. The story is still great with the usual pacing style of the previous seasons. There's just something very addicting in the pacing of the story, it feels like no second is wasted at every episode. Each one brings something new to the story, good news and more hurdles at the end of the episode. The cliffhangers really get you excited to watch the next episode too. The plot twists are still the same as ever, they seem pretty petty and weak for an anime but they're realistic and you can really relate to them because they fit the slice-of-life genre very well. Art is still the same, it's different but it's neither bad nor good. It doesn't stand out and that's actually what makes it fit for it's genre. Bakuman isn't about flashy art, dramatic music and all that glitter. It's good as it is. Though the quality drops at times, it doesn't really affect the viewing enjoyment. The sound is like the art, it's the same.. not bad and not good. The OP is decent and the singer's voice is kinda weird but it doesn't really bother me. The EP is good, nothing to say about that. No objections about the sound really. Characterization is the same and still good. Same goes for character development, in fac there's actually a little bit of character development as soon as the first episode. Bakuman is still addicting as ever, that's all I need to say. Overall, the quality didn't drop one bit. It's basically an extended Season 2, which was already perfect in my point of view. It's as interesting as ever and I don't think it needs any improvements at all. Any plans to change some things up 'for the better' would've backfired on them. Bakuman 2 and 3 is one of the best Animes I've seen. Dreams are hard to follow and even harder to make them come true. Whether it's getting securing your ideal job, marrying someone you always admired, or becoming a superstar, dreams require many ingredients to make it come true. It requires hard work, determination, motivation, creativity, and even a little luck. Yet, when people follows these dreams, it can be surprising on how much they realize about their goal and about themselves. In Bakuman 3, the series follows two best friends who hopes to achieve their dreams and become professional manga artists. Ahh, Bakuman once again returns as the third installation of this trilogy, known as Bakuman 3. It's amazing how this show can still keep it together after several years. The series is written and illustrated by Tsugami Ohba, who is known for his famous work Death Note. In contrast though, the series does not give off psychological impressions but rather follows a slice-of-life style of presenting its story. The series has achieved universal success with its manga predecessor and likewise, I find that the third and final installation manage to keep it together once again. The series follows two best friends, Moritaka Mashiro and Akito Takagi. Collectively known by their pen name, Muto Ashirogi, the duo hopes to make a name for themselves by getting serialized in the Weekly Shonen Jump. With a little hard work, motivation, determination, and luck, they might just be able to do just that. Like its previous predecessors, Bakuman 3 presents itself as a slice-of-life style series. Dreams are hard to make into a reality but we can clearly see that Muto Ashirogi hopes to do so. It follows their youth lives in a natural way as opposed to normal teens. Most teens often think about their future and dream jobs later on in life but at only 9th grade, the duo Muto Ashirogi has already began to climb that ladder to success. It's not easy though as becoming a manga artist is a very stressful way of life. In fact, Moritaka already knows this with the unfortunate circumstances of one of his family relatives. It even strived him away from thinking about the dream in the beginning. Furthermore, there is competition. Becoming a manga artist is a lot harder said than done. In fact, it can be compared to climbing the world's tallest mountain, winning an Olympics gold medal, or achieving a world record in the Guiness Book. Okay, I'm probably exaggerating a bit here but you get the idea. It is not easy. Surprisingly, Bakuman 3 incorporates many ideas from the art of manga creation itself. It presents to viewers how manga is made with the ideas, how to get the material published, and how the industry works directly with many of its episodes. It looks hard and definitely requires a lot of effort. Yet at the same time, watching this series makes the career seem fun and exciting. In fact, it's that much exciting when Muto Ashirogi gets recognized for their work at various circumstances. In a way, Bakuman adapts its series of manga-in-manga but in a way that makes it look like a lifestyle. The slice-of-life continues to exist just like its previous predecessors. It follows the duo in their every day live mixed in with comedy, drama, and romance. The drama part comes from Nakai who continues to linger his ways of going after Aoki despite their previous encounters. It doesn't stop there though as a love triangle ensures between him, Aoki, and Hiramaru. It's two guys and one girl in a triple threat. As silly as it sounds, the love triangle plays more of a progressing role for Aoki as she makes her stand and point known. With the dramatic romance part aside, the technical part of Bakuman 3 also comes into play with some controversial events. In fact, Ashirogi Muto gets some unprecedented media attention after some unfortunate events. The duo wanted to make a name for themselves but not in the way that they see it this time. It gets a bit complex and even causes stress to the duo for their dreams. Forget dreams, it's more like a nightmare now after such an event. It should be no surprising though as the author of the series wants to visualize what manga artists needs to deal with in the real life. It's realistic in many senses from this case as becoming a manga artist is never easy. There are challenges every day whether it's competition, scandals, overworking to meet due times, and bringing out ideas to audiences in its finest form. The imaginations that manga artists comes often requires extensive thoughts and planning as well. I personally found that the ideas used by Ashirogi Muto is a bit repetitive and even borrowed from themes used by the real artist/illustrator of Bakuman. In other words, although the series' manga ideas are fun to read, they often lack a bit of uniqueness or set themselves differently from others. It's often hard to present ideas when so many others exists beforehand but overall, I only considered the ideas that Ashirogi Muto came up to be....average. Fortunately, I find Ashirogi Muto and their way of working to be quite interactive and fun. Often when working together, the duo seems to have more fun than expected with their ideas. It's not in a workaholic way in which the duo tries to be the very best or earn cash but rather to do what they enjoy in while hoping to achieve success. Even when the duo are arguing, the dialogue is presented in an entertaining way. The words spoken by the characters are colorful and often or not, becomes an inspriation for their ideas. These ideas are transformed into their product for the world to see. Of course, success isn't easy to come by especially with competition. Major supporting characters as Eiji are obstacles for Ashirogi Muto and they must overcome him to achieve that success. On the more dramatic side, Bakuman 3 also introduces what some fans may see as a real antagonist in the form of Toru Nanamine. He represents the antithesis of Ashirogi Muto. On the surface, he looks like a fun and outgoing guy with a chill personality. However, deep down he is seen as a hot-tempered, manipulative, and an individual who is willing to do absolutely anything to achieve success. The construction of his character makes him an antagonist by the way he compete against Ashirogi Muto because he even relies on underhanded tactics to ensure his assumed victories. To him, making manga is about winning and being the best in contrast of Ashirogi Muto who wishes to achieve their dreams. Bakuman 3 does seem to continuously adapt a slow pace. Furthermore, the many dialogues used between the characters often gets dull, lacks flavor, and dragged. The seemingly antagonist Nanamine is also easy to predict by viewers as the villain by the way of his actions. It's not hard to see him as a two-faced individual who wishes to become the best even relying on iniquitous tactics. These tactics of course doesn't always go the way he wants to. The artwork of the series remains intact compared to its previous seasons. J.C. Staff adapts the anime based off of the manga and does a fit job in making its artwork intact. And of course, because this is an anime series based on making manga, the artwork created by the various artists themselves also are presented artistically well. The artwork in fact is edgy but gives off that realistic look at the series from the outside. In the inside, the manga and characters' designs gives off a natural sort of look. It looks realistic and doesn't look too flashy, not that it needs to be anyways. There is no fan service and fans shouldn't be surprised at this considering it's NHK network known for airing lighthearted series. For the soundtrack department, everything seems to remain the same. Both the OP/ED song for the first and second half depicts on a montage of the main characters. Some of the soundtrack does to be repetitive but still retains its natural vibrations. It balances it out with the general lighthearted outlook of the series. Overall, Bakuman 3 is a pleasant series for me and I think for fans, especially those who've watched the previous predecessors. Even if you don't like the idea of making manga, the series makes it interactive with its extensive dialogues, competitions, and characters' interactions. And of course, some of the manga ideas themselves can be entertaining. It's not easy making dreams come true but Ashirogi Muto sure has great hopes. They're climbing that ladder of success and opening doors to imaginations. Bakuman 3 is a great continuation of the series. I enjoyed watching it and I can definitely say that it will be worth your time as well. Here's the review. As with the previous season, it hasn't lost it's edge on story telling and pacing. It's easy to follow and easy to understand. My only issues are some arcs are a bit uninteresting and unfulfilling, like the Nanamine arc. Great art as always. Proper visual effects, no awkward animations or anything etc. Pleasing to watch, I should say. would prefer Bakuman. 2's OP. The character development was great and I really like how they interact witth each other. Eiji is definitely the standout as I appreciate how his eccentric behavior hasn't changed at all. Kazuya Hiramaru also improved also, not only in the comedic sense. Every episode makes me either laugh or feel emotional. The scenes will always put a smile in your face because they are just so great. It deserves the title of masterpiece because it isn't just enjoyable but also it has been considered a piece of art. This is an anime you can watch over and over and still end up not being bored. Let's get things straight - this series is amazingly good. I want you to have that in mind as you read on since I would like to write about all 3 seasons and not just this one - I would like to sum up my experiences with the entire package. This whole adventure started when two men decided to share their dream (albeit for a different reason) and follow it through no matter what obstacles they face with their unwavering resolve. What followed was one of the best plot-driven stories I had the pleasure of enjoying. I should start by pointing out that for me there are two things about the story that must succeed in order for the plot to be interesting. Number one - the story itself has to be interesting. Number two - the way it's presented must be interesting - this includes pacing. And Bakuman does both in a superb manner. We have two men trying to create the best manga that ever existed - personally I was allways kind of interested in the process of manga creation and I admit even though I don't know how the market really works - the way it was presented here made me want to try and make a story myself (that is despite the fact that my drawings would horrify people...) - it's not easy and your goal isn't just laid in front of you - but it pays of if you mange to actually do it. Now I believe the reason why pacing is so great is because it's so uneven. At times we will spend and entire episode with our characters thinking over one issue but then there are also episodes with 3 timeskips a few weeks each. This helps us focus on what's important at the moment. Sometimes the focus is on micro - when they discuss what to change in a chapter of their work. Sometimes the focus is on macro - when we have multiple timeskips that show how their changes influence the popularity over a larger span of time. With this we can look at the story from two different perspectives and it's not boring. I don't think many people would argue but the art was really really good. Maybe not Makoto Shinkai good but still - right below that. Also please note that if it was made in a Makoto-like style I would probably rate it lower since the art is very fitting for the characters (I had a slight problem with the gag/parody animation but only a minor one) and it trully is a pleasure to the eyes. It rarely happens but I actually enjoyed every single one of the openings and endings and the music in the series itself was were it was supposed to be. It wasn't something that would grip my heart but then again - this isn't a story about musicians. For the most part I'd say it did the job it was supposed to do. Oh yes - this is the main reason I loved it so much. Characters for me are absolutely the best part of the series - it doesn't mean it's perfect of course. So let us begin with our double protagonists - Takagi and Mashiro. They are the driving point of the entire story obviously but for me what steals the show is the chemistry between them. You can really see how they try their best and how they support each other over the span of all three seasons. There were moments where I thought "what he's doing is stupid" but then I reflected - maybe I wouldn't do it but Mashiro would - it's very fitting for his character. If I were to choose my favourite however I'd pick Takagi - I loved his resolve. In every single season he did things that made me think "he's awesome". The only problem I had with him is I believe he should really pay more attention to his wife. As for female protagonists - Kaya and Miho. Miho was the weakest of all the characters in my opinion - I found the concept she thought of "not seeing each other" as being silly but I must admit it really was a sweet thing. Not to mention I can't even imagine how I would feel if I was working for something so hard for so many years - I believe that feeling would probably be worth all that wait. Probably. Yeah... probably. She had a weird feeling for me nonetheless but she grew on me and while I had a problem with her in the first and second season - I was totally fine with her in the third. As for Kaya - I think she's my favourite character here. Partly because she's so invisible in the third season. It's allmost like the story wouldn't even change at all if you take her out of it. But it only makes her greater in my eyes since I couldn't wait when she shows up. Her emotions towards our male protagonists, her cheerful cheering (pardon me for that) and the dedication she puts into helping them makes every scene with her in it a real feast. I think the real strength of her character is also what we don't see - as her support for our mangaga duo is only seen on the surface as it would seem. I won't write about every single character since it would take too long so I'll just try to summarize it real quick. Most of the characters introduced were very enjoyable to watch and they all had their unique... "quirks". Nizuma seemed completely insane, Aoi and Fukuda focuse on her work, Hiramaru is incredibly lazy - and it goes on. What we get is a pretty wild mix of characters with different views on obtaining the same goal. It goes without saying that I enjoyed this series tremendously but I can't convey all of that in just a few simple words. Even though there were moments I found less interesting - I still couldn't stop watching and I launched one episode after another. This is the pinacle example of the syndrom I call "I just started an episode and it's already end credits" where you get so completely absorbed by the story that you lose the sense of time. I would like to trully recomment the entire series for everyone - you shall not be dissapointed!